Ahhh summertime! Books are packed away, worksheets are lost in a file folder somewhere, flashcards are forgotten. Learning is put aside for the next three months! Around these parts, we really only have two seasons...winter and a couple nice weeks of summer. This limits the number of days we have to get outside and enjoy the sunshine. So, it's easy to see why I naturally opt to pack away "school" from June through August. working on long division that they are not learning. On the contrary, it has always been my goal to instill a LIFELONG love of learning...not just the September through May kind. That's one of the MANY benefits of homeschooling...learning doesn't have to stop simply because the vacation begins. On the whole, I tend to be a bit of a planner. Whether I am making plans for a living literature history lesson, a hands-on unit study for science, or a times table worksheet in math, I ALWAYS have a plan. Along the way, we often deviate from the plan to do a little free-stye exploring of a topic...but the PLAN is always there. I find freedom in a plan. Welcome to Day 1 of our Five Days of Summer "Unschooling!" At the risk of sounding too "scheduled" when referring to unschooling, my PLAN for today is to share a few simple and budget friendly ideas to get your kids writing during the summer. For those of you who have reluctant writers, I hope that these thoughts will help to add some "jazz hands" to an otherwise laborious subject. And if you have a Sweetie Pea at your house who is never too far from pen and paper, I hope a few of these ideas will be the nice "cherry on top" for you and yours. My sweet sis shared this great idea with me and I'm so excited to pass it on to you. As I was preparing these simple cards, Super Boy's curiosity was MORE THAN peeked! I searched discarded magazines for intriguing pictures...action shots work best. I cut them out and glued each to a 4 x 6 card. Using the pictures for inspiration, I wrote out simple writing prompts and a short "word bank". I asked open-ended questions about what was happening in the picture. I wrote a starter sentence that might ignite the beginnings of an epic adventure. I gave them a topic to write about based on the picture happenings. The "word bank" words were just suggestions to help spark inspiration, ensure proper spelling of things they might potentially write about, and challenge them to create an IMAGINATIVE tale...I occasionally threw in a random word that had absolutely NOTHING to do with the picture to see if they could somehow weave it into their story. These open-ended drawings were all the rage in the mid-80s when I was in school and are slowly finding their way into writing world again. To make a squiggle picture story, draw a simple design or unique mark somewhere on a piece of paper. Challenge your child to turn the page in any direction and use the mark to make a complete picture. Encourage them to use the drawing as the illustration of a story. You can see from the picture that a squiggle can evolve into just about anything. On this particular day, Super Boy used this half-sun shaped design I had scribbled to make the ear and crazy hair of a boy while Sweetie Pea thought it looked more like the crown of a princess about to get married. If you are making squiggles for multiple children, I might suggest drawing it first on a 3 x 5 card or a piece of scratch paper. Lay the card underneath the blank drawing paper that the child will use, trace the squiggle onto the paper, then repeat for the next child. In moving the squiggle around the page so that no ONE page has the design in the exact same spot, you are ensuring that no two drawings look alike...and therefor every story will be different. 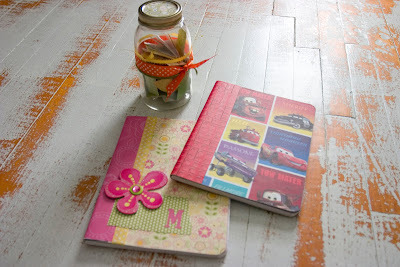 A few years ago, I ended our summer by crafting up a journal jar and personalized journals. The journals were made out of composition notebooks covered in scrapbook paper with cute embellishments added here and there. I find that a fanciful journal is more inviting than a plain sheet of notebook paper. I used an old mason jar, some colorful ribbons, and coordinating scrapbook paper to make a jar that would hold several dozen writing prompts/story starters. I hand-wrote all the "starters" out on colorful paper, threw them in the jar, and sat back as the kids created silly summertime...and eventually school time...stories. You could use this same concept to create a Summertime Mommy & Me Journal and write together. Need a few "starters" to get you started? "Cows, sheep, and chickens belong on the farm, not in the middle of the..."
"I opened the packaged marked 'Handle With Care' and out popped a..."
"If I could do it all over again, the one thing I would definitely change is..."
"The hefty tug on my fishing line was proof that I had caught the biggest..."
"A red balloon just floated into my bedroom window. I wonder where it came from..."
"The postcard said that she would be here in two weeks. Was that enough time to..."
"It was quiet...too quiet! That could only mean one thing..."
"I had worked for months trying to get it to work. I was so close to finally inventing a..."
"They called my name. I had won! I had won the award for..."
"The best part about having a pet porcupine is..."
"I turned on the news and heard a report that it was now against the law to..."
Both Sweetie Pea and Super Boy have out-of-state penpals that they write to during the school year, but they occasionally get the notion to write letters in the summertime. Although Sweetie Pea has learned proper friendly letter form, I don't sport my grammar police pen when it comes to her penpal letters. I love the fact that she loves to write and never want to squelch that passion with a red pen. I might occasionally make a suggestion here and there, but mostly leave her to her own words and work. This uncomplicated correspondence has the added bonus of receiving good old fashioned "snail mail." And what kiddo doesn't love getting an envelope with his or her name on it? Not surprising, I'm a big supporter of writing a blog. Summertime is a great time to help your child start their own on-line chronicle. Obviously for security reasons, precautionary measures should be considered. 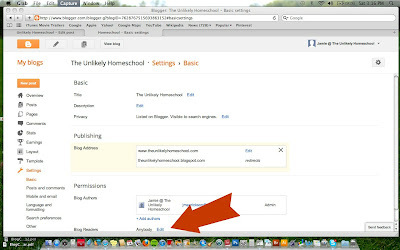 But, I have found that blogging services like Blogger have built-in security settings for making a blog visible to invited readers only. Both Sweetie Pea and her best gal-pal are both avid bloggers and spend time each week updating their web-based biographies. I have saved her settings to be accessible to Mom and Dad, grandmas, aunties, and a handful of friends. Like her momma, she finds it quite cathartic to "put it down in words." To select a privacy setting on Blogger, go to your dashboard. Click on "Settings" -->"Basic". Towards the bottom of the screen, you will find "Permissions." 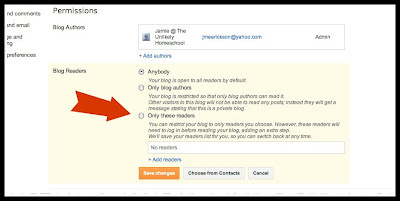 Under "Permission", find "Blog Readers." Initially this will be set to "Anybody", but once you click "edit", a menu box will open up to give you more reader options. The third option will be "only invited readers." 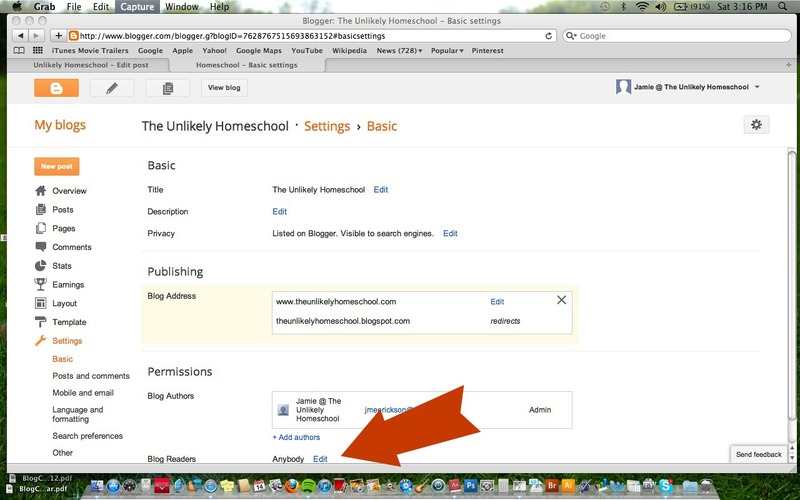 Click the button and begin adding the email addresses of the people you wish to invite to read your child's blog. They will receive an activation email via blogger and will have to log on to the blog using their email address and a password of their choosing. Five Days of Summer "Unschool". Want some more summertime ideas? 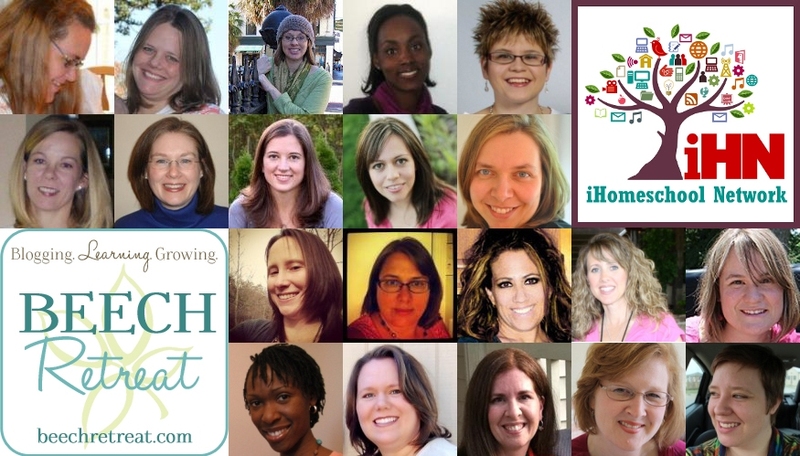 From July 16-21, join me over at iHomeschool Network for the Five Days of Summer Series brought to you by Beech Retreat and 20 fabulous homeschool bloggers from around the web. 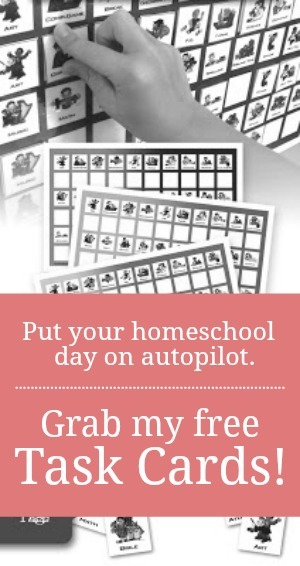 That's 100 homeschooling ideas, kid-friendly activities, and homemaker helps to make this a summer to remember! Love this, Jamie! We're honing our writing skills this fall... but why wait! So excited about these amazing ideas and I look forward to reading the next four days. I look forward to having you! 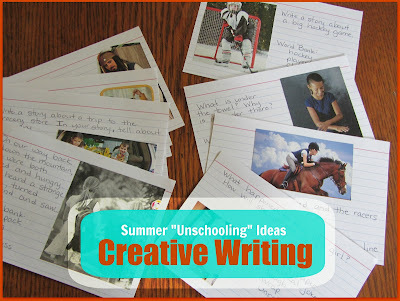 These are some great ideas!I love the writing prompt cards. In fact, I distictly remember when I first developed my interest in writing. It was in Mrs. Boot's second grade class. I was given a picture of an old wagon wheel sitting in the middle of a field and was told to write about it. I also remember a picture of a dog "driving" a car that we were given to write about. I still think of Mrs. Boot as my favorite teacher. Often at school we are reminded that learning is a continuous process. Being outside school or after finishing a degree does not mean one stops learning. Everyday, new things are being uncovered. If people stopped learning, there will be no progress. Hence, it is a great practice to instill in the minds of the young ones to love being educated. Thanks for this idea. My daughter and son has autism and ADHD. But my daughter is 7 yrs old and loves making up stories and making books. Now that im homeschooling her i wanted to find a way as a learning stragedy and come up with something creative. Thanks for this idea, you are god sent and god bless you. I'm so glad you have gotten a few ideas. I hope they work for you. If you are on Pinterest, be sure to check out my Creative Writing board. I have pinned lots more ideas from around the web. Awesome ideas I'll be saving! I really like the blog idea! My son likes to watch EvanTube and wants to make videos, but I don't want the whole world to be able to see him, y'know? But I like the idea of making it private for family and friends to see. He has a teaching gift, so perhaps making videos is one way to help culture that gift.